Blog Quick Quotes: Karan: Tin Type! Hello scrappy friends, Karan here for my first time hosting the Quick Quotes blog! Hope you are enjoying your Monday so far! I am so excited to share with you my first project as a Design Team Member for Quick Quotes. I loved the look of Tin Type online, and when my Design Team Box arrived, I couldn't wait to dig in. 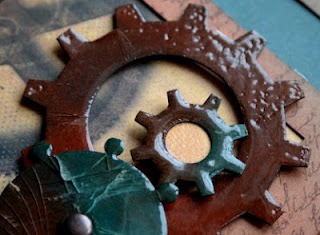 When I saw the Chipboard Laser Diecut Painters Tray in the DT Box, all the lovely inks and the Tin Type line in real life, I knew exactly what I wanted to do, I wanted to incorporate some ink blending on my first DT Project. Blending Techniques: To begin, I used three colours of Powder Puff Inks on this project by blending them together with each colour. Mango Mai Tai, the new Baja Blue (love this colour) and Mocha Mama I heat set it to dry. Once it was dry, I used a Hero Arts script stamp, and Mocha Mama and stamped over the entire Painters Tray. I then heat set it to dry again, (I didnt want to take any chances that I might touch it accidentally and smear the ink). Cracked Glass Technique: I covered the Gears with the same colours of ink I used on the painters tray. I then heat set them to dry, and covered each gear with Versa Mark, then coated them with UTEE, and heat set. I repeated this step three times on each gear until I achieved the look I wanted (clear like glass) I then let these cool. Once they were cool, I bent each Gear and cracked the UTEE. The "I will always love you" is from the Itty Bitty Velum Quotes, I cut it down to size to fit the Chipboard Frame! and then I popped it using foam adhesive. Actually, all the frames on this project are popped as are the photos. Materials Used:Gears: Bag o Chips, Frames Bag o Chips, Painters Tray, Itty Bitty Velum Quotes, Mango Mai Tai, the new Baja Blue ( love this colour) and Mocha Mama. Other products used: Tim Holtz rosette die, doily border die, Ek Success Scallop Border Punch, Martha Stewart Butterfly Punches, Stamping Up Heart Punch. Key is Bo Bunny. Creative Impression Brads. Nicely done,love all the detail. Very, very pretty!! I loved the "cracked glass" technique and can't wait to try it! Your tray is GORGEOUS!!!!! Love all the techniques you used here! gorgeous project!! love the texture and techniques you used!!! love it! Very pretty, Karan! I love this new paper line and you did a good job of showing it off. Beautiful job blending the inks! This is terrific. The local scrapbook store just ordered me a dozen of these trays for a class...I am not sure what the theme will be, but as soon as I saw the tray in the catalog,I knew I would have to design something! Thanks for the inspiration! Wow!! This is amazing!! I love how you "crackled" the gears! And your use of the PowderPuff Chalk Inks is amazing! 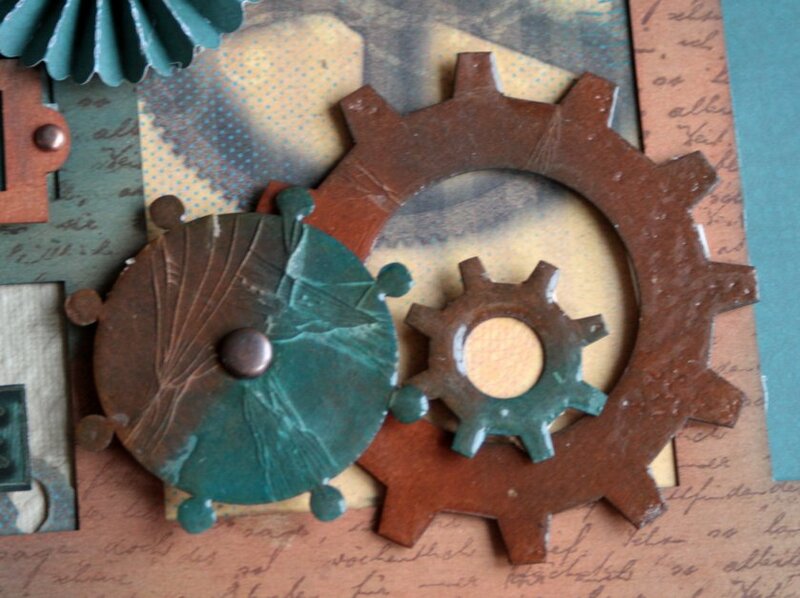 I like the blending on the gears. I need more practice with my Powderpuff Chalk.